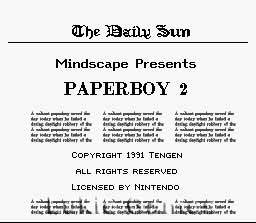 Paperboy 2 SNES Super Nintendo Game Cartridge Cleaned Tested and Guaranteed to Work! Rise and shine, bud! 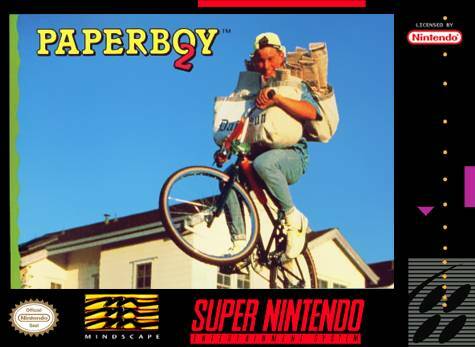 A great day's ahead, just waiting for you to become the neighborhood's terror of a paperboy. but it's a whole new job with double the fun and twice the excitement! That's right, you've now got houses on both sides of the street - which means even more customers' homes to deliver papers to and non-subscribers' homes to damage. It also means you've got to watch out for lots more obstacles and meanies that are out to knock you off your bike! Wreak mischief across the town or do good deeds like saving the baby and stopping the burglar. At the end of the day, hone your skills on the all-new BMX-style test course. 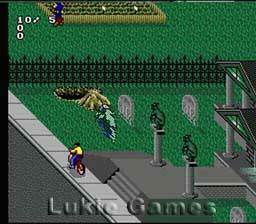 Add the new awesome graphics, and you're in for a rip roaring time on your bike! Blast from the past like games is on point. This game is exactly how I remember it. Works great! I purchased this and it works great! I popped it in my SNES and it started right up. Lukie games sent this very very quickly and I couldn't be more satisfied! Everytime I play this game my hands are glued to the controller. The game was in great shape when I received it. Thanks Lukie! This is one of my all time favorite games of the Super Nintendo and I was thrilled to be ale to find it for my daughter when she got out her old system to play. 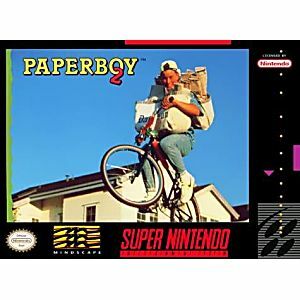 I am 50 years old and my daughter is grown but we still love to play Paperboy.I couldn't believe the great selection of games Lukie Games has. Thanks Lukie I will shop again. I always loved playing this game with my brother growing up and i was surprised to find out that i still knew all of the little tricks. when i introduced the game to my friends, (we're all around the age of 19) they couldnt really get into it. so unless you grew up playing this game then you may not get that much play value, so be sure to check out gameplay on youtube and see what you think before making a purchace! thanks for reading.